Suburban Plastics is a privately owned custom molder of thermosets, thermoplastics, and engineered composites. Suburban Plastics was founded in 1946 with a single press molding component for a single customer, a nearby trophy manufacturer. Since that time, Suburban Plastics has grown and diversified into one of the leading thermoset and thermoplastic manufacturers in the United States. Suburban Plastics in Elgin, Illinois is - ISO 9001:2008 certified. 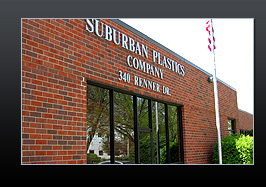 Currently, Suburban Plastics operates in two locations, Elgin, Illinois and Grenada, Mississippi. Suburban Plastics utilizes 220,000 square feet of manufacturing space, with future plans of expansion. Suburban Plastics employs over 300 employees. Suburban Plastics has a solid reputation for timeliness and quality. Schooled in the gravity of customer commitment and service, this family managed company will remain mindful of its modest beginning and will continue to treat each customer with a singular respect and dedication.